There aren’t many tiny houses out there that offer all the amenities of home, yet allow you to pack up and relocate on a whim, but the Vista from ESCAPE Homes is a 160-square-foot getaway that does precisely that. Big pane windows make the tiny space feel much bigger, framing your view du jour perfectly as you recline on the generous daybed or cozy up with tea in the dine-in kitchen. 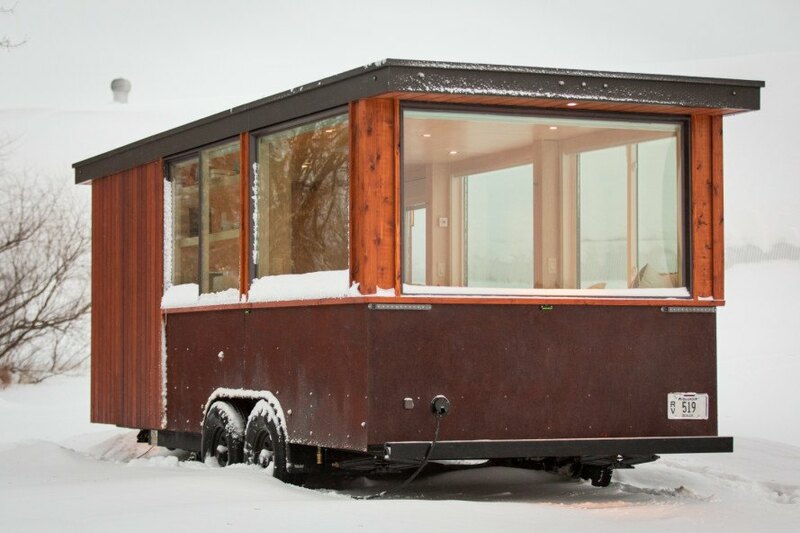 This tiny mobile home is not your ordinary RV, but a spectacular and cozy cabin on wheels. The Vista, at its core, has a great deal in common with traditional recreational vehicles. The trailer measures 20 feet long by 8.5 feet wide trailer with a standard hitch, towable by any vehicle capable of handling the 6,500lb load. The basic model comes with standard RV hookups for water, electricity, and septic and that’s approximately where the similarities end. Beyond that point, the Vista offers amenities that no other travel trailer can possibly live up to. For starters, it’s crazy cute. The Vista has plenty of space for lounging, with smartly designed storage and all the necessary functions built right in. The trailer sports a full daybed at one end, a handsome galley kitchen with space for a compact bistro table and two chairs. Down the hall, a bathroom with a shower and toilet hide behind the privacy of a solid door – something most RVs don’t have. 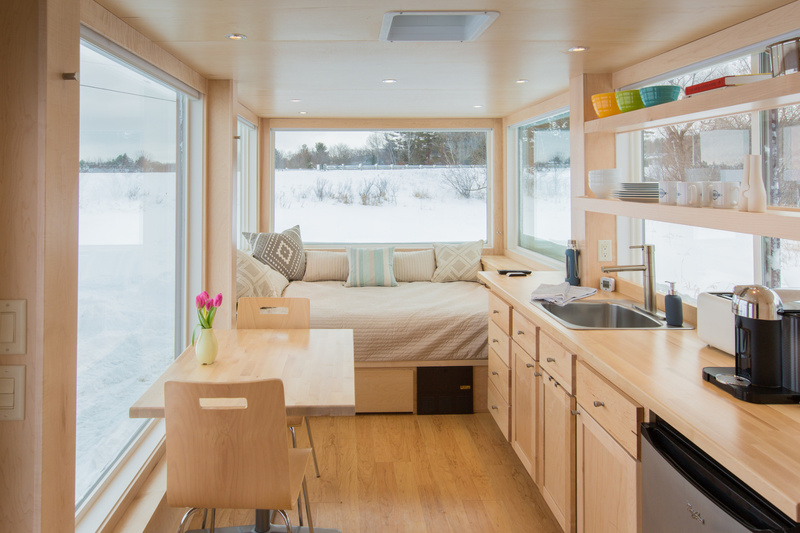 Wisconsin-based ESCAPE Homes added some other features to the Vista we like even more. The trailer is available with an array of off-grid capabilities, thanks to optional solar panel systems and lithium battery energy storage. A self-contained composting toilet eliminates the need for black water hookups, while gray water from sinks can be fed into an irrigation system for reuse. The Vista retails for an introductory price of $39,900, down from the MSRP $46,600 for the base model with standard options. The Vista, at its core, has a great deal in common with traditional recreational vehicles. The trailer measures 20 feet long by 8.5 feet wide trailer with a standard hitch, towable by any vehicle capable of handling the 6,500lb load. The basic model comes with standard RV hookups for water, electricity, and septic and that’s approximately where the similarities end. Beyond that point, the Vista offers amenities that no other travel trailer can possibly live up to. For starters, it’s crazy cute. The Vista has plenty of space for lounging, with smartly designed storage and all the necessary functions built right in. 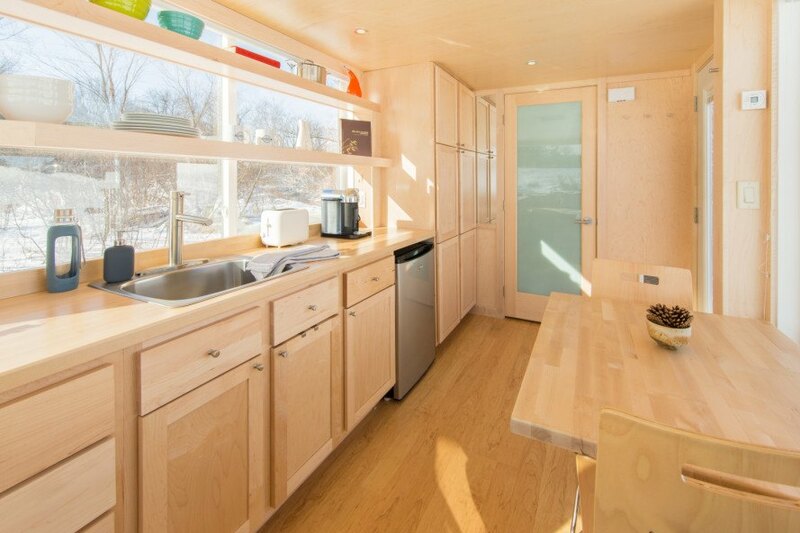 The trailer sports a full daybed at one end, a handsome galley kitchen with space for a compact bistro table and two chairs. Down the hall, a bathroom with a shower and toilet hide behind the privacy of a solid door - something most RVs don’t have. Extra storage is tucked away in every nook and cranny. Wisconsin-based ESCAPE Homes added some other features to the Vista we like even more. The trailer is available with an array of off-grid capabilities, thanks to optional solar panel systems and lithium battery energy storage. A self-contained composting toilet eliminates the need for black water hookups, while gray water from sinks can be fed into an irrigation system for reuse.